Dr. Thomas Pulinilkunnil (left) and PhD student Purvi Trivedi. (Photos courtesy Dalhousie Medicine New Brunswick). Dr. Thomas Pulinilkunnil and his team of researchers are experts in dealing with broken hearts. Working out of the Nutrient Signaling Metabolism Laboratory at Dalhousie Medicine New Brunswick, Dr. Pulinilkunnil’s laboratory examines cellular metabolism to understand and treat complex diseases, such as obesity, diabetes and heart disease. 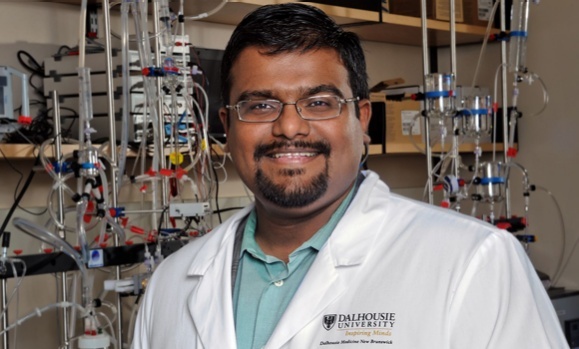 An associate professor in Dalhousie University’s Department of Biochemistry & Molecular Biology, Dr. Pulinilkunnil’s research has explored the role of lysosomes, which are the “garbage cans” of our cells. He says his lab was one of the first few to focus on lysosomal changes in the hearts of people with obesity and diabetes. “We found that obese and diabetic hearts have compromised lysosomes – their ability to dispose of and recycle waste is significantly constrained. This protein, called transcription factor EB (TFEB), binds to the DNA and regulates the expression of genes that are important for lysosomal signalling – essentially controlling every aspect of lysosomes. Ineffective lysosomes in the heart trigger greater accumulation of “garbage” than it normally would, which makes heart cells less efficient over time and eventually leads to heart failure. "If you cannot understand biology, you cannot understand disease"
Dr. Pulinilkunnil says that advances in technology and research will continue to make it easier to manage diabetes, referencing a recent article he read about prototype smart contact lenses that can monitor the wearer’s glucose (sugar) levels in tears, but stresses that an outright cure may not be imminent. Dr. Pulinilkunnil is among the Dalhousie Medical School researchers who are part of WAVE teams recognized by the Faculty of Medicine in an alignment of the school’s strategic research priorities announced in October 2017. He’s part of one of two Wave 2 teams; IMPART – CVRG (Cardiovascular Research Group), a multidisciplinary group of Dalhousie-affiliated clinical and discovery science researchers who are involved in studying cardiovascular biology, cardiovascular disease and health issues. The research cluster focuses on helping vulnerable populations suffering from cardiovascular diseases, including pregnant women and babies, frail and elderly patients, and those with obesity or diabetes. Matters of the heart may be top of mind on Valentine's Day, but for researchers like Dr. Pulinilkunnil, they're a year-round focus.